At DRW Financial, we care about community. A core focus of our business is on giving back: we aim to assist local non-profits in their development efforts, and to help philanthropic families plan their giving for lasting impact. 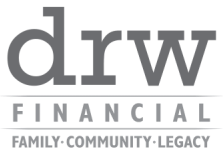 Non-profits interested in planned giving seminars and cooperative efforts are welcome to set a consultative appointment with DRW Financial. Our goal in working with local non-profits is to go beyond the simple bequest and create a donation channel with more stability, visibility, and consistency. For clients who care to support a charity or non-profit organization, DRW Financial seeks to bring a sophisticated approach to giving. We encourage clients to maximize the impact of their gift for the charity, and to fully realize the value to the giver as well. We coordinate with the giver's accountant and estate attorney, and tailor the financial management piece to fit the overall charitable giving strategy.